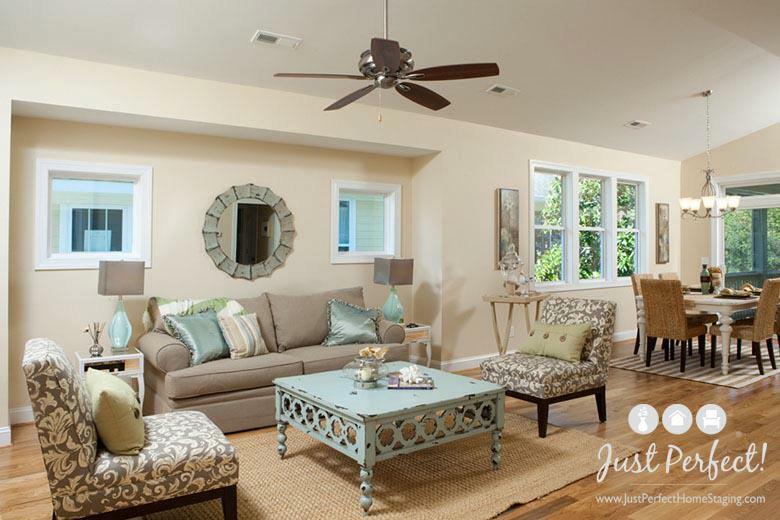 The relaxed coastal lifestyle that we have the good fortune of experiencing here in Jacksonville, particularly in the beach areas, is taking trend across the country, particularly as it pertains to design and home decor. Log on to sites like Houzz, Pinterest, or even Facebook and you’ll find that shabby chic is back, only it’s been cleaned up and modernized into coastal chic. This trend includes lots of repurposed and painted furniture. Unlike shabby chic of the past, coastal chic includes both bright and muted colors. 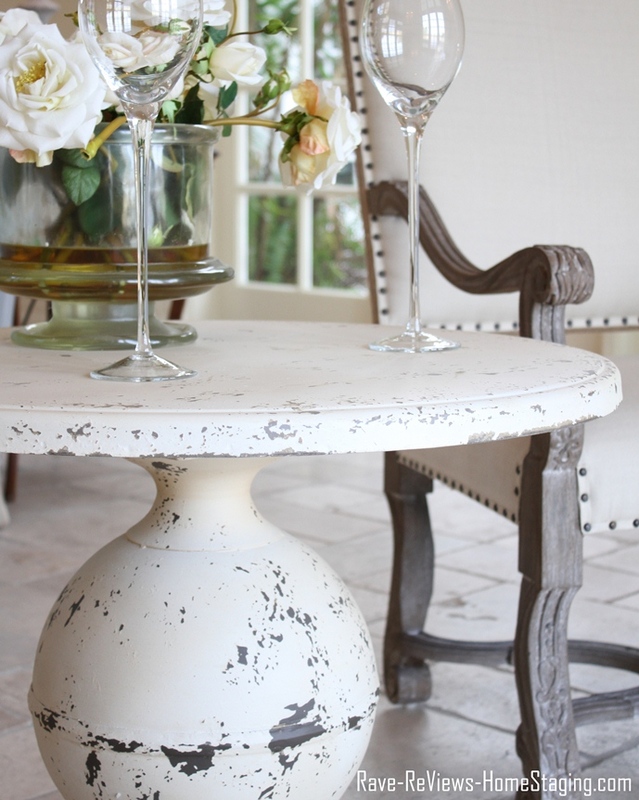 Usually chipped and distressed, the best pieces have lots of great curves or cut outs. 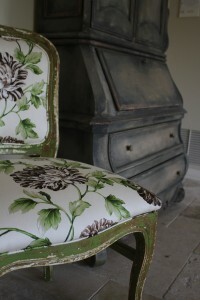 Using painted furniture in coastal design. While some people still love the old distressed white, and off white, today’s painted furniture comes in lots of bright and muted colors. The painted table in this Wilmington, North Carolina room pulled in some of the coastal elements trending all over the internet. This seafoam blue table has tons of character and blends nicely with this monochromatic palette. This second room by Just Perfect Home Staging shows that even the addition of a single blue table can help add the coastal design element. The soft monochromatic tones and texture of the seagrass rug lend to the coastal design trend as well. My home staging company, Rave ReViews, regularly repaints furniture for use in our inventory. Taking old pieces and remaking them into something new, fresh, and modern is not only a lot of fun, but it differentiates us from other staging companies that are still stuck in the Bombay look of last decade, or worse yet, using corporate style rental pieces that don’t reflect the Jacksonville lifestyle. 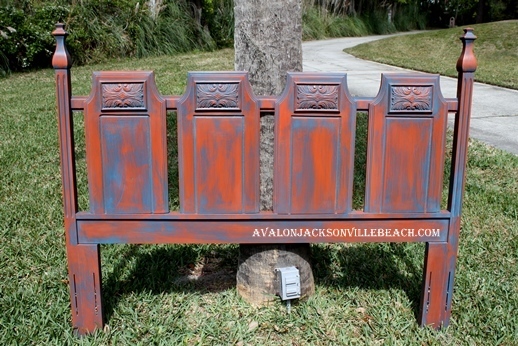 This old footboard has been given new life by using several coats of Milk paint in layering colors. By adding D-rings on the back, we are able to attach it to the wall, behind the mattress, box, and rails. Find out how we created this transformation and view more photos. Don’t be afraid of mixing and matching painted pieces either. 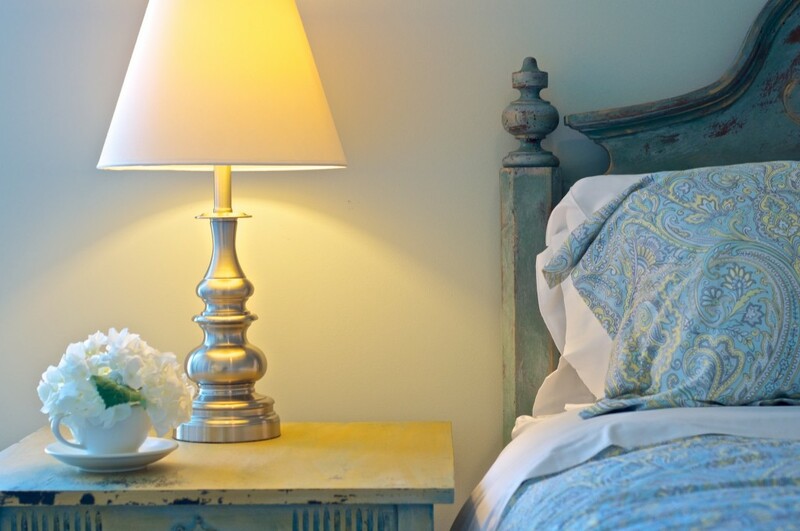 This pale yellow table was paired with an antique headboard that was accented with teal and gold. 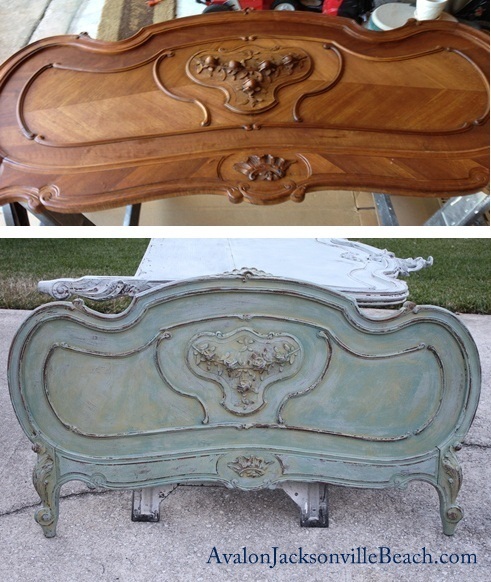 See how we refinished this table and headboard. Of course, as I mentioned earlier, not all of the painted furniture in coastal designs are soft beachy tones. The new coastal look includes some outrageously bright colors as well. 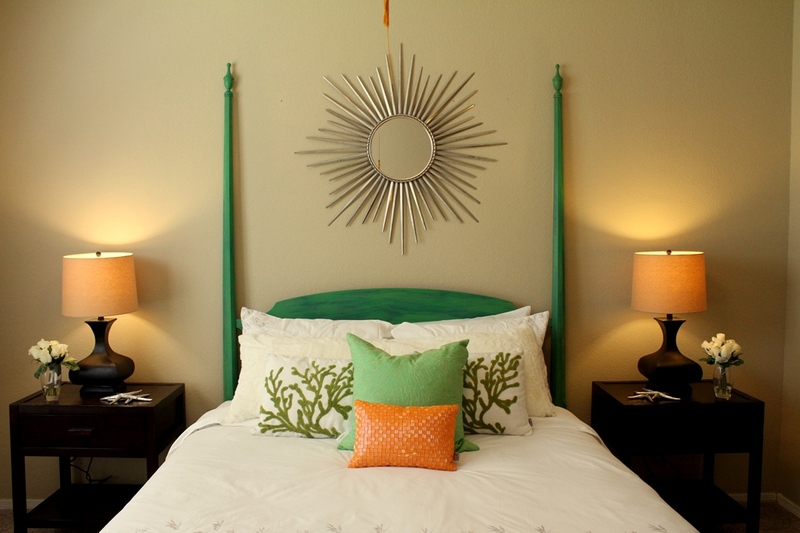 See how we used these headboards and a bed-in-a-bag to create luxurious coastal spaces. Finally, don’t think that this painted look is just for wood. 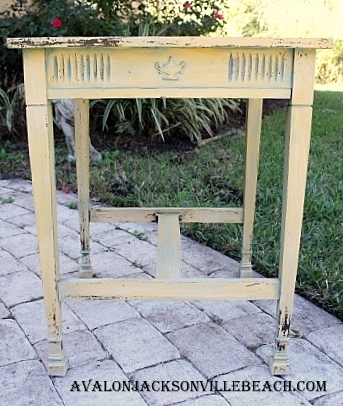 Anything that you can paint, may be the perfect application for this shabby coastal chic look. Check out this great metal table that we used in a home staging project in Deerwood. This luxury home was once the site of a treaty signed by President Gerald Ford and Anwar Al-Sedat of Egypt – showing that coastal chic can fit in just about everywhere.